How much do Magic suites cost? 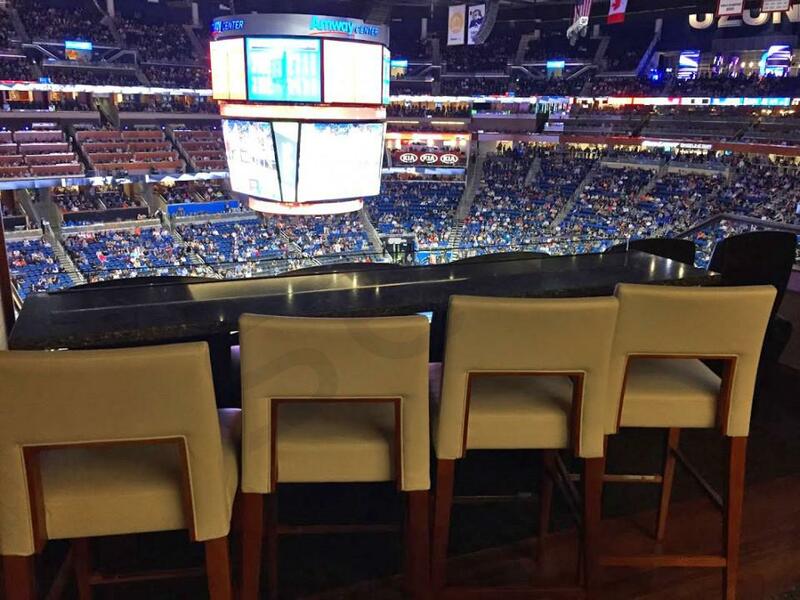 Fully private suites for Orlando Magic games typically range in price from $2,000 - $4,500. Suite prices will vary based on opponent, day of the week, and suite location. Suite pricing for concerts and other events at the Amway Center will vary widely based on the type of event. Founders Suites are located at the top of the lower bowl, just 19 rows from the court. These suites include 16 tickets, premium parking and VIP entrance, private entertainment/bar area, and access to exclusive lounge areas in the stadium. Presidents Suites are situated below the 200 level concourse, which gives you and your guests an excellent vantage point. These suites include 16 tickets, VIP parking and entrance, private entertainment/bar area, and various seating options for your guests. If all goes right, it isn’t out of the question for the Orlando Magic to compete for one of the final playoff spots in the Eastern Conference this season. Led by new head coach Steve Clifford and franchise player Aaron Gordon, the Magic will be fun to watch all year. Former fourth overall pick Aaron Gordon made major strides on both ends of the floor last season. Still just 23 years old, Gordon improved his stats across the board, and most importantly, he developed a consistent three point shot. In the summer the Magic extended Gordon to a 4-year, $80 million contract, leaving no questions that he is their franchise player moving forward. His exciting style of play from above the rim and beyond the arc bring a jolt of energy to the court at Amway Center. Another player who is a key part of Orlando’s future plans is rookie Mo Bamba. The Magic selected Bamba sixth overall after he spent one year at the University of Texas. At 7’0” with an absurd 7’10” wingspan, Mo Bamba is a freak athlete. He is a dominant rim protector who has shown flashes of elite offensive skill, should he put all of his tools together. Expect the progression of Mo Bamba, especially his perimeter shooting, to be a key storyline following the Magic this season. Even though there is plenty to be excited about with Mo Bamba, he starts the season coming off the bench behind Nikola Vucevic. Vucevic is consistently one of the most skilled big men in the league who often slips under the radar around the NBA. His veteran leadership will be essential to Orlando’s success. Rounding out the starting lineup is Evan Fournier, D.J. Augustin, and Jonathon Simmons. Fournier has established himself as one of the league’s better shooting guards and someone the Magic can rely on down the stretch in close games. Simmons enjoyed a solid season in his first year in Orlando, averaging 14 points with great defense in nearly 30 minutes per game. The Orlando Magic will be an exciting team to watch this season, and you can experience the action from a private luxury suite on a game-by-game basis. An Amway Center suite is the perfect outing for any occasion, whether it’s for business or pleasure. Magic fans will get exclusive access to the suite concourse and private VIP entry into the arena. 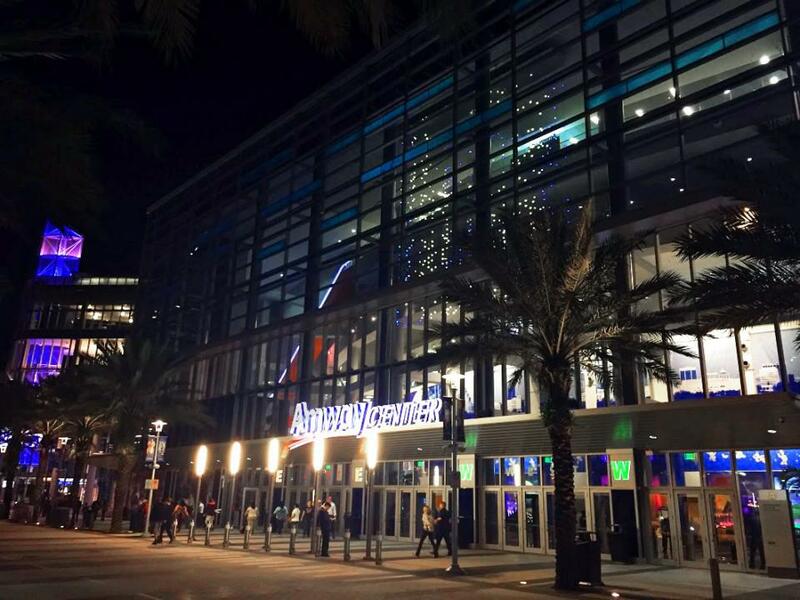 Amway Center luxury suites feature HDTVs, extra wide plush theater seats, interior lounge area, premium in-suite catering options, and a dedicated suite attendant. After a flurry of offseason activity, the Orlando Magic have added veteran talent to their young core and look like a legitimate contender in the East. Despite the added veteran talent, this team is built around their young core of Aaron Gordon, Elfrid Payton, Evan Fournier and Nikola Vucevic. Aaron Gordon is a high-flying forward who excels at running the floor and finishing around the rim. Gordon, an Arizona product, finished second in the dunk contest last season and is a sure bet to pull off at least one highlight reel dunk per game. Elfrid Payton is the Magic’s floor general and on the court head coach with a penchant for pulling off tricky behind the back or no look passes. When Payton is fully engaged he runs his team at a fast pace looking to create as many easy baskets as possible similar to Magic Johnson. The first of the Magic’s two outstanding Europeans is French wing Evan Fournier. Fournier broke out last year and had his best season yet, finishing with 15.4 points per game, 2.8 rebounds per game and 2.7 assists per game. The final foundational piece for the Magic is Montenegrin big man Nikola Vucevic. Vucevic has been by far the most consistent scorer for the Magic over the past couple seasons and once again had an excellent year last season scoring 18.2 points per game while pulling down 8.9 rebounds per game. In the offseason, they traded for forwards, Serge Ibaka and Jeff Green, as well as center Bismack Biyombo. Each of Orlando’s incoming players has playoff experience and brings a winning pedigree to a team that is looking to put it all together for a playoff push. Ibaka and Biyombo are monster rim protectors and finishers who have been vital contributors on teams that have made deep playoff runs. Green is an electric athlete with a swiss-army knife skill-set who should fit in perfectly with the young core of the Magic. If the talent meshes together like it should, this Magic team will likely be a playoff team and playing meaningful games at the end of the year. The Orlando Magic will be an exciting team to watch this season and you can experience the action from a private luxury suite on a game-by-game basis. A Magic suite is the perfect outing for any occasion whether it’s for business or pleasure. Magic fans will get exclusive access to the suite concourse and private VIP entry into the arena. 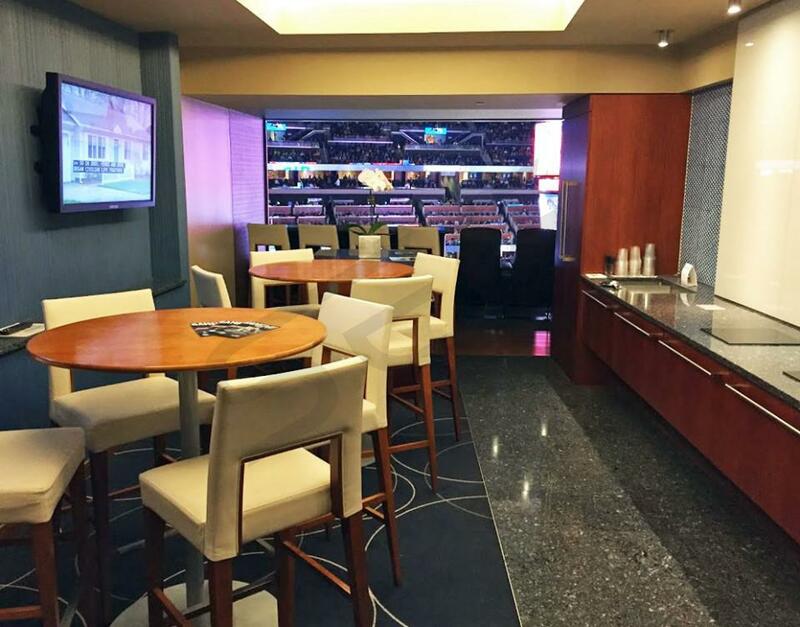 Amway Center luxury boxes feature HDTVs, extra wide plush theater seats, interior lounge area, premium in-suite catering options and a dedicated suite attendant. The Orlando Magic are one of the league’s youngest teams and will continue to develop their core group in 2014-15. More minutes are on the way for Victor Oladipo, Tobias Harris, Nikola Vucevic and Maurice Harkless. Oladipo had a fantastic rookie season and will be leaned on to lead this young team. Vucevic proved to be one of the top centers in the league after averaging a double-double last season. The Magic signed power forward Channing Frye in the offseason to help spread the floor. This young team may not have the experience right now to make a playoff run but they’ll be exciting to watch at the Amway Center. A Magic private luxury suite is the perfect outing for any occasion. Magic fans will get exclusive access to the suite concourse and private VIP entry into the arena. Amway Center luxury boxes features a lounge area and extra wide plush theater seats for premium comfort. The Orlando Magic are one of the league’s youngest teams. The Magic are focusing on developing their future stars such as Nikola Vucevic, Victor Oladipo and Tobias Harris. Rookie Oladipo has shown flashes of his offensive ability and will be a huge offensive weapon for the Magic moving forward. Veteran Arron Afflalo is carrying most of the load in 2014, he’s averaging over 20 points per game. 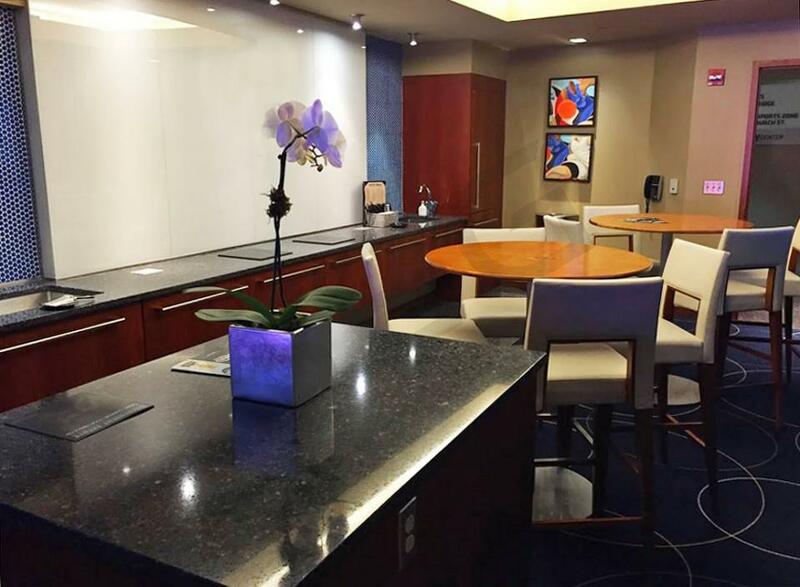 A private luxury suite at the Amway Center is the perfect way to watch the Magic grow as a team. Fans will get exclusive access to the suite concourse and private VIP entry into the arena. Each luxury box features a lounge area and extra wide plush theater seats for premium comfort. Thank you for signing up for specials at Amway Center. Enter your email address below to stay in touch. We'll sign you up for our newsletter, which will inform you of the latest inventory and events at Amway Center. We promise we will never sell or distribute your information. 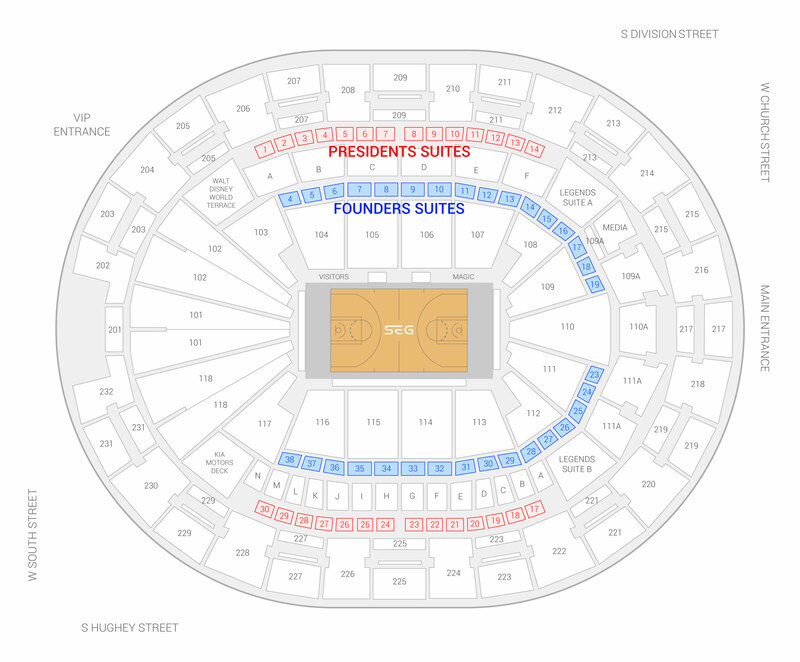 The seating chart below shows where the Orlando Magic suites at Amway Center are located.